Norman Mineta's baseball bat was confiscated when he was sent to a Japanese-American internment camp as a boy. As a Congressman, he was sent a $1500 bat, which he had to send back, as it exceeded a price limit on gifts. He was quoted as saying, "The damn government's taken my bat again." 3. After a bank teller refused to validate John Barrier's 50 cent parking because he was dressed poorly, he withdrew his million dollars from his account and took it to the bank across the street. 5. Desi Arnaz and Lucille Ball avoided using ethnic jokes, as well as humor based on physical handicaps or mental disabilities during the run of "I Love Lucy" due to a belief in "basic good taste"
The half-penny was discontinued in 1857 when the U.S realized it was worth too little; however, when the half-penny was removed, it had more purchasing power than today’s dime. 7. Former Governor Arnold Schwarzenegger once issued a veto letter with a hidden message (F*CK YOU). When asked by a newspaper if the message was intentional, Schwarzenegger's spokesman said only, "what a strange coincidence." The paper noted that he was "clearly being sarcastic." 8. In 1980, Detroit gave Saddam Hussein a key to the city out of recognition of donations he made to local churches. Drowning in real life looks nothing like in the movies, and in fact, many parents actually watch their children drown, having no idea that it's happening. 12. Thomas Grasso's last meal before his execution was 24 mussels, 24 clams, a double cheeseburger, 6 ribs, 2 strawberry milkshakes, half a pumpkin pie, strawberries, and a can of SpaghettiOs. His final statement was, "I did not get my SpaghettiOs. I got spaghetti. I want the press to know this." 13. Lice eggs are called "Nits." Thus, a "nitpicker" was someone who meticulously looked over each hair to make sure it was lice-free. 15. Stan Lee is the highest grossing actor of all time. His 39 films have taken in $7,748,462,823 to date. 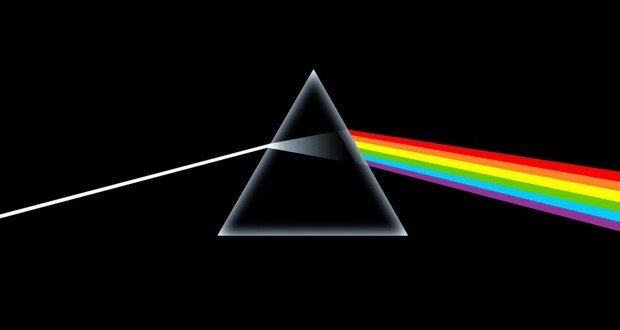 Although "The Dark Side of the Moon" was the #1 album for only one week, it remained on the Billboard top 200 for 741 weeks straight, from 1973 to 1988. 17. The captain of a United flight had a heart attack mid-flight, and so an off-duty air force captain, Mike Gongol, had to help land the plane, saving 160 lives. He knew he had to help when he heard the PA announcement "are there any non-revenue pilots on board, please ring your call button." 18. One of Tokyo's busiest train stations, a rail line was converted from an above-ground line into a subway. There were zero service interruptions. The lowering of the rail line's tracks into its subway position was done in one night, during its normal service off hours lasting ~4 hours. 19. From 1902-1907, a group of 12 scientists regularly ate dangerous, common food additives that had previously been untested, such as formaldehyde, and documented how they reacted to said additives. They were known as "The Poison Squad," and helped spur the creation of the FDA. 20. The Japan Air 123 accident, the deadliest single aircraft crash of all time. The crew could not control the plane so they used thrust to go up and down and differential trust to turn. It crashed after 32min. No simulation reconstruction held out as long as the crew did. In 1984, a 1-year-old named Baby Fae received a heart transplant from a baboon but ended up dying 21 days later due to rejection. When questioned with why a baboon and not a primate more closely related to humans, the surgeon said he didn’t believe in evolution. 22. Rutka Laskier, a Jewish girl from Poland who died in Auschwitz at the age of 14, wrote a diary describing her experiences under Nazi occupation. 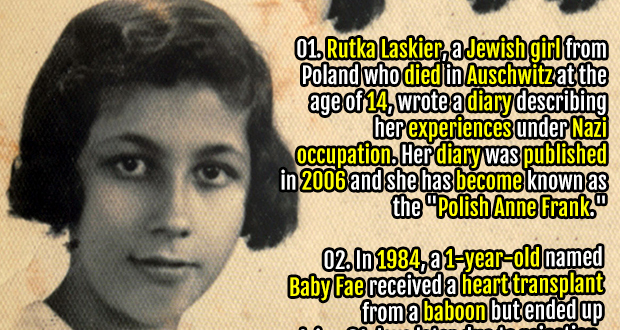 Her diary was published in 2006 and she has become known as the "Polish Anne Frank." 23. For the Apollo 11 moon landing conspiracy theory to be true, over 400,000 people would need to be part of the secret. 24. The Sydney Opera House actually has terrible acoustics. Edo de Waart, the former chief conductor of the Sydney Symphony Orchestra, once threatened to boycott the building. There is an A$202 Million project to renovate and improve the acoustics.